I feel I need to start by saying this recipe is by no means authentic. I probably shouldn’t even be calling it a Pad Thai but hey that’s the beauty of freedom of speech. It is a great, tasty way to pack a lot of vegetables and lean protein into your midweek meals. In Asia Pad Thai is usually served from street-food vendors or at casual restaurants and has become a very popular British take-away. You’ll often find it served with chicken or prawns but tofu is actually the traditional ingredient used to make Pad Thai in Thailand. The dish is a massive crowd pleaser – in fact I’ve yet to encounter anyone who isn’t a fan – I think it’s due to the balance of flavours. It feels fresh, slightly sweet with just a dash of spice. It can however, if done badly, be greasy and stodgy. Here’s why I love my version; It’s really tasty, pretty quick, filling and you feel like you’re eating something a bit naughty, even though you’re not, it’s less than 550 kcals per portion and the portion is big, which I like! The prep is the longest part, once you have everything ready the dish can be cooked from start to finish in about 10-12 mins. 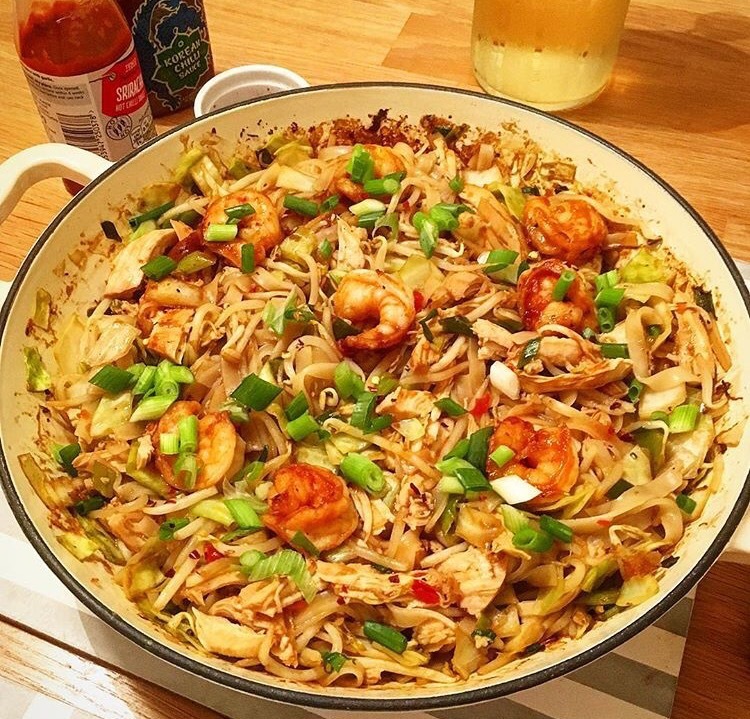 You don’t even have to use noodles you could use the ever trendy courgette or zero noodles if you’re cutting down on carbs . I find zero noodles are a good method to trick my brain into thinking I’m eating carbs, when I’m not, in a way that courgetti doesn’t quite manage. It’s a great example of what I like to call my good mood food. Meals that are full of lean protein and nutritious vegetables that also taste amazing, they’re good for your mental health as well as your physical health. I tend to talk a lot about the befits of eating the right foods especially when you suffer with mental health issues, so forgive me if I repeat myself but I really can’t stress it enough. For me often an anxiety attack happens when I haven’t been taking care of myself. I may have drank too much alcohol, not slept enough and more than often been skipping meals and failing to refuel my body. It’s no surprise that this is when the anxiety strikes. You need your body to be in the best possible condition to ensure those negative though processes don’t start to creep into your mind. The trick for speedy cooking is to get everything ready before you start. So chop all your veggies and have them in bowls or piles on a plate or board. Get your sauce mixed and soak and drain your noodles. This way the cooking will be really simple and the veg will stay nice and fresh and wont overcook while you chop like a maniac. 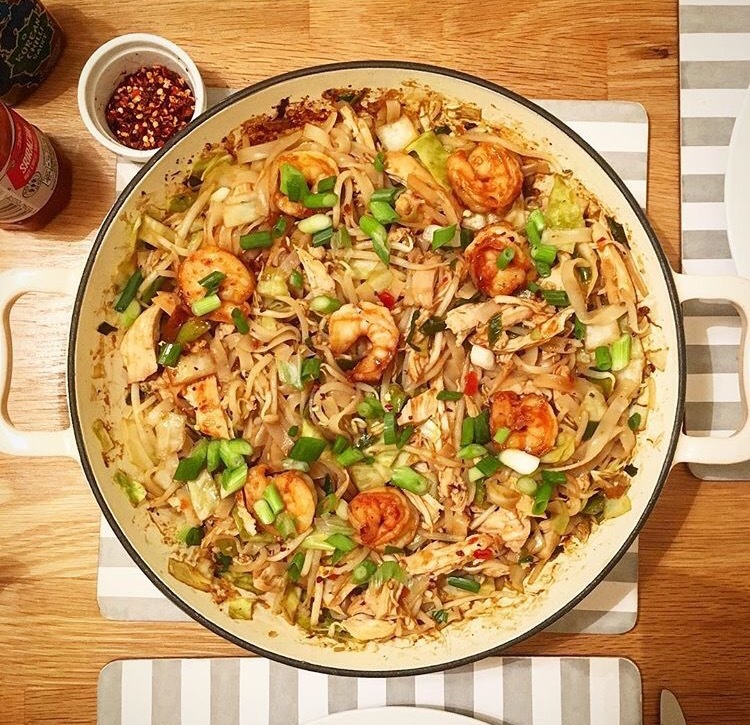 I hope you like my version of Pad Thai, happy mindful cooking and eating! This makes a good next day lunch for work too so even if there’s only 1 of you eating I’d make the whole batch and pack any leftovers up in a tuppawear. Mix together the sweet chilli sauce, ketchup, the juice from half of the lime, the tamarind paste and most of the soy sauce or fish sauce & rice wine leaving about 1/4 a tsp of each. Slice the spring onions finely on the diagonal, separating the white and the green parts. Roughly chop the coriander and peanuts. Roughly chop the stems of the pak choi leaving the leaves whole. Slice the chicken into bite size strips and drizzle with a little more soy sauce and some black pepper. Have the stock next to your pan, adding this while cooking stops the dish drying out without adding too much oil. Beat the egg and egg whites with some black pepper and the reserved soy and rice wine . Brush a large non-stick frying pan with some of the oil, on a medium/high heat. Pour in the eggs and move the pan so they spread out in a thin, even layer, scatter on a few herbs. Cook for about 1 minute, until set, then tip out of the pan onto your chopping board and roll up like a pancake, then slice into strips. Set aside. Use a high heat to keep the cooking quick. Wipe the pan out if you need to, if not add half the remaining oil along with half of the ginger & garlic pure, cook for 15 seconds while stirring then add chicken and a small spoon of your sauce. Fry until golden brown adding a splash of stock if you need to, then chuck in the prawns with a little more of your stock. Toss for 1-2 minutes until the prawns are firm and pink and the chicken is just cooked through. Tip into a bowl to set aside. Add the last of your oil and ginger & garlic puree then tip in the white parts of the spring onions, beansprouts and cabbage with another splash of stock. Cook for 1-2 mins, until just wilted with a little crunch. Add the noodles, most of the spring onions and the sauce you mixed earlier and toss so everything combined and is coated evenly. Using metal tongues will make this easier, Return the egg, prawns & chicken and mix well, add the pak choi then heat through then stir in most of the coriander and divide between bowls. Garnish with the chilli and nuts (if using) and the reserved green spring onions and herbs, with the other half of the lime cut into wedges for squeezing over.